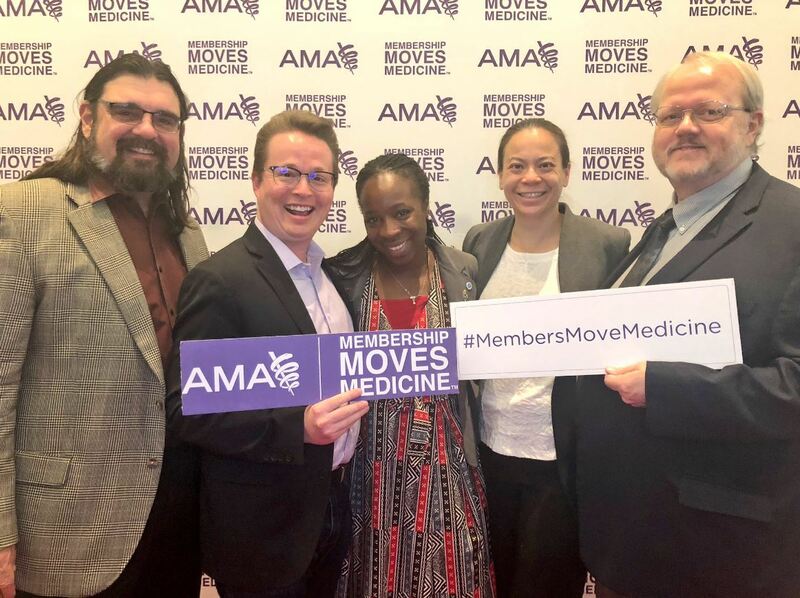 Delegate Chad Kollas, Alternate Delegate Ron Crossno, and Young Physician Section Delegate Kyle Edmonds represented AAHPM at the American Medical Association House of Delegates Interim Meeting. They advocated for patients with serious illness in testimony to reference committees and worked with the Pain and Palliative Medicine Section to craft new policyaddressing misapplication of the CDC Guideline for Prescribing Opioids. Alternative Payment Model (APM) Task Force Chair Phil Rodgers, Past President Janet Bull and CMO Joe Rotella met with the director and staff of the Center for Medicare and Medicaid Innovation to discuss community-based palliative care and advocate for a serious illness APMthat reflects key priorities of the field with regard to patient eligibility, participating providers, payment and quality. Advocacy and Awareness Strategic Coordinating Committee chair Gregg VandeKieft represented AAHPM at the second Integrative Pain Care Policy Congress. He was one of 80 attendees from more than 65 organizations representing healthcare providers, public and private payers, policy experts, and pain research and patient advocacy organizations invited to consider joint strategies for advancing individualized care for people with pain. AAHPM staff members Steve Smith, Katherine Ast, Laura Davis and Angie Forbes attended the annual meeting of the Council of Medical Specialty Societies and had the opportunity to meet with staff members from other societies. The plenary sessions featured presentations on the Grateful Patient Project, the future of continuing board certification, and a new model for the VA.
As a co-sponsor of the meeting, AAHPM was also present as an exhibitor at the Palliative and Supportive Care in Oncology Symposium (#PallOnc18) this week in San Diego. It was a great opportunity for Academy leaders and staff to talk with attendees about AAHPM and the upcoming Annual Assembly. Thanks to all the members who stopped by to say hello. Steve Smith, CEO and Peggy Reilly, Director of Governance and Operations, traveled to Georgia to meet with President Tammie Quest and President-Elect Joanne Wolfe to review strategic priorities and plans for 2019.